Following non-payment to its affiliates, Eyeline Trading has announced it will be rebooting as WealthBoss next month. Dan Putnam and Jean Paul Ramirez launched Eyeline Trading in mid 2018. The company advertises a 0.66% daily ROI, paid in bitcoin. 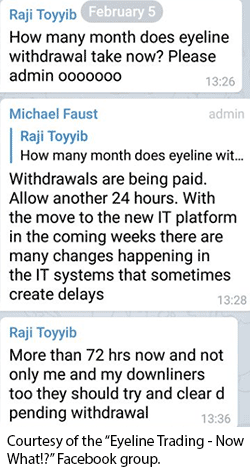 The ruse behind Eyeline Trading’s ROI payments is bitcoin trading. To date however no evidence of bitcoin trading being used to fund Eyeline Trading ROI payments has been provided. Neither Eyeline Trading or its owners are registered to offer securities in any jurisdiction they operate in, meaning the company operates illegally in any country that regulates securities. Eyeline” is a friendly name (literally “line of sight” …) but does not really evoke the purpose of the company (enriching its customers by generating a regular income and perennial). In English, “eyeline” is a common name which complicates marketing efforts (SEO on search engines, etc.). The above excuse was part of a series of explanations, sent out to Eyeline Trading affiliates in late January. There was a desire to remove the word “Trading” in the trademark. First, to allow the future to generate earnings from other activities than trading, and also because it might suggest that customers have to trade themselves, but this is not the case. The brand “WealthBoss” has already been filed 3 years ago by the marketing manager Dan Putnam, and removes the risk of dispute of anticipation by a potential future competitor. In an attempt to smooth over concerns of a collapse, Eyeline Trading compared themselves to Nike, Pepsi, eBay, Pepsi and Google, who they claim all initially operated under different names. In short, the name does not matter. Long-time participants and observes of the MLM underbelly meanwhile will see Eyeline Trading’s collapse for what it is. WealthBoss is expected to launch in early March. Reboot schemes rarely last as long as their predecessors, so expect WealthBoss to go under even faster than Eyeline Trading has. Eyeliner- Gary Woods: Looks like Gary was in front of another scam MLM loser, you were really hyping this one up! A great write up as always Oz. I’m sorry to ask this but one of our admin team has an OCD problem and I know he won’t sleep unless somebody says something. Our group’s are called Now What!? And not Now What?? Sad I know. Keep up the great work, it’s VERY helpful. Everyone is welcome to share anything they find posted in our groups, the more exposure these criminals get the better. Arr that caption is hardcoded into the image. I’ll get around to it later today. Sorry about that. OK I’ve fixed the caption. Might take a few hours for cache to update. It is March 11, 2019. where do I go to login to Wealth Boss. What, they haven’t set up the website yet? Maybe they’ve abandoned it. Sorry for your loss. This site is a complete joke, I’ve been with Eyeline For a year and always gotten paid. find something better to do,to you everything is a scam, what a shame. Whether you’ve managed to steal from Eyeline Trading investors who joined after you is neither here nor there. Nor does it change the fact that Eyeline Trading collapsed. to you everything is a scam. WealthBoss’ Alexa rank is 1.4 million. Sorry for your loss. I cannot believe so much trash information about EyeLine. The company have being paying since day One. So much haters that don’t have nothing to do. And the rename is because of a new marketing strategy, there’s nothing bad about that. The company is just starting with new products and payment plan. The company have being paying since day One. That just happened to coincide with Eyeline Trading unable to pay its investors? Ponzi collapse, new name. This is old hand scamming. Well there’d be less if scammers such as yourself stopped coming up with it. Wealth Boss’ website Alexa ranking is almost 1 million. Sorry for your loss.